드럼의 소리가 가슴을 먼저 치고, 빠른 총탄 처럼 당신의 스피커를 공격한다. 하지만 곧 뒤, Meric Long의 핑거스타일 코드가 Logan Kroeber의 브레스 너클 비트 위에 흘러 들어 온다. Dodos의 명곡들만이 할 수 있듯이. No Color의 주 초점은 초창기때부터 있었던 광란의 포크(folk)를 담는것이다. 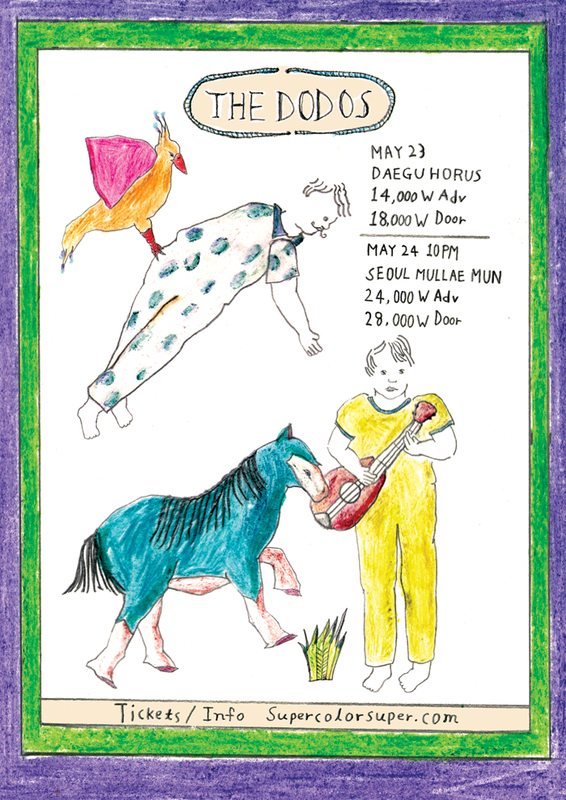 The Dodos는 이것을 매우 성공적으로 해냈다 – 적의를 품게 만드는 다이내믹과 머리를 복잡하게 만드는 코러스의 “Black Night”부터 경쾌한 퍼커션과 소녀감성이 섞인 “Good”까지. 거기다 인스트루멘탈 곡인 “Don’t Stop”과 차가운 리듬 사이에 기습적인 어택 솔로가 껴 있는 “Don’t Try and Hide It”은 120 Minutes (MTV의 얼터너티브 뮤직을 위한 프로그램)의 오래된 에피소드들을 녹화하고 싶게 만든다. 마치 Long이 청소년기 때 가지고 있던 플란넬 시대의 환상들을 드디어 실현하게 된 것과도 같다 – 동네 약국 한 켠에 놓인 잡지 속 기타 탭들을 찢던 그 시절처럼. 이제는 더 이상 실수할 틈이 없다는 점. This forward motion feeling has driven the duo since 2005, but several key changes lift their fourth LP (No Color) to another level. For one thing, the band reunited with Portland producer John Askew, the man behind the boards of the Dodos’ first two full-lengths, Beware of the Maniacs and Visiter. Having an old friend around was like adding an honorary third member; a voice of reason who can isn’t afraid of vetoing illfated ideas. Ideas like glossy layers of vibraphone that lost their luster halfway through. It’s as if Long’s finally got to live the flannel-era fantasies that started when he was a teenager, tearing guitar tabs out of magazines at a local pharmacy. The catch? There’s less room for error than there’s ever been.